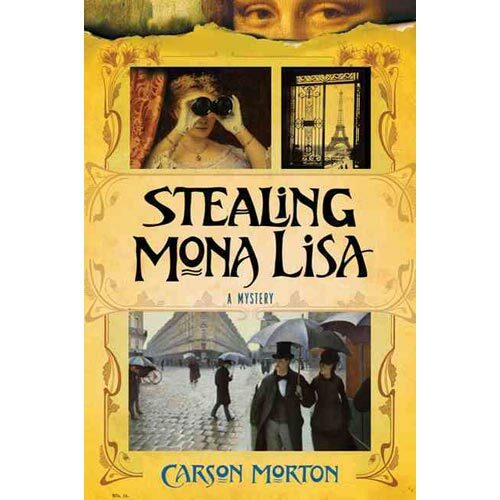 An image of Paris, A Rainy Day by Gustave Caillebotte called out to me from the cover of a 2011 book entitled Stealing Mona Lisa by Carson Morton. Because the painting is one of my favorites; I decided to investigate the book. I am pleased to report it is an enjoyable novel. The fictional story is based on actual events which transpired in 1911 in Paris when the Mona Lisa was stolen from the Louvre. It is a suspenseful story. The tale begins with a reporter sent to interview an elderly man who, years later, claims to have knowledge of the theft. From there, we are taken back in time not to Paris as one would imagine, but to South America. The story winds its way to the City of Light where a cleverly written plot reveals how and why the Mona Lisa was stolen from the museum. I enjoyed many things about this book. The peppering of French words in the text was just right and easy to understand. The story kept my interest all along the way and the ending with a twist surprised me. If you enjoy a good mystery, I believe you will enjoy this novel. It’s a good one! This entry was posted in Uncategorized and tagged art, Books, Carson Morton, France, Mona Lisa, Mystery, Paris, Stealing Mona Lisa. Bookmark the permalink.